I remember Cin Cin from their early days, serving prosecco and antipasti from a cute vintage Fiat van. I think I even went to the launch, and very nice it was too, as were their series of pop-up events. But mamma mia, did we need a permanent base for some real Italian food in Brighton. If only to allow me to actually recommend a restaurant, rather than dramatically sighing before launching into a 30 minute monologue about the importance of regional distinction and diversity across Italy whilst the person asking glazes over. Amazingly, in a city where the food scene is flourishing, Italian food has generally remained in that generic sloppy pool of tourist pleasing pizza* pasta set menus, risotto or if really pushing the boat out, a chicken Milanese (served with spaghetti - natch). 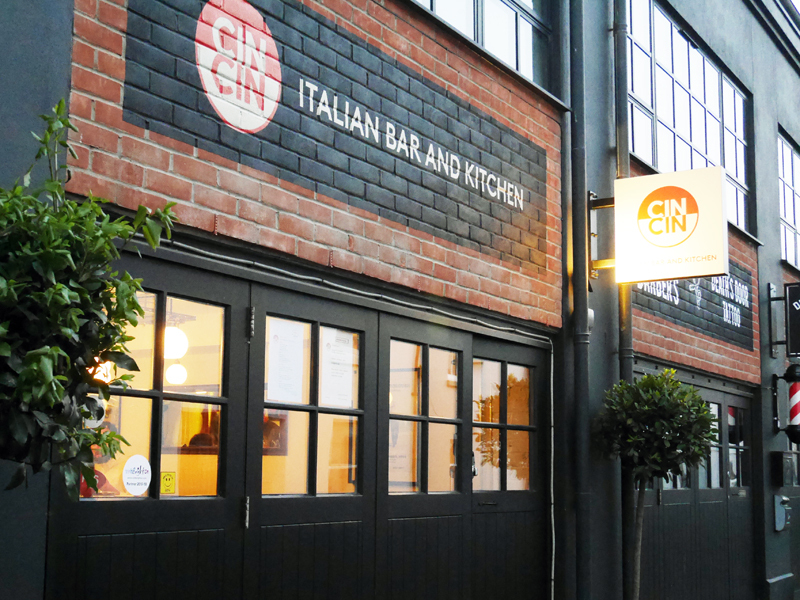 Enter Cin Cin in restaurant form. No checked tablecloths, no greyscale pictures of some random moustached zio on the wall, no oversized pepper mills and no plastic strings of garlic hanging from the sodding ceiling. 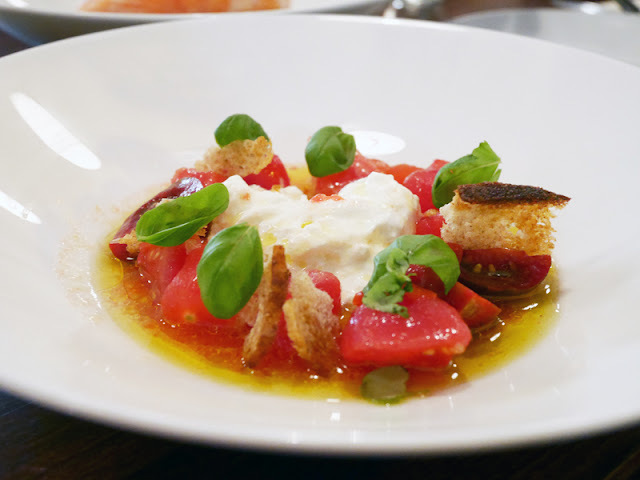 Housed in a former MOT garage and tucked in a side street, as all good restaurants in Italy are, the petite interior is a modern working of a trattoria. Diners sit around a communal chipboard clad bar overlooking the open kitchen and dine on simple, honest but exquisitely executed dishes. We were dining lightly so begrudgingly passed over some of my favourite things like lardo, culatello, and bresaola, instead opting for all of the three small plates. I have popped in before and supplemented a glass or two of prosecco with a selection of their antipasti and nibbles; it's all good and the fact that you can tailor your meal precisely to your appetite is handy. The small plate dish of new season tomatoes was Italian cooking epitomised; simple with ingredient as hero; sweet, full flavoured tomatoes. Making up the flag colours were basil leaves and stracciatella, the rich creamy, soft buffalo cheese you get in the centre of a burrata. Drizzled with grassy extra virgin olive oil, a healthy pinch of sea salt and a few pieces of bread, this combination never gets tired. 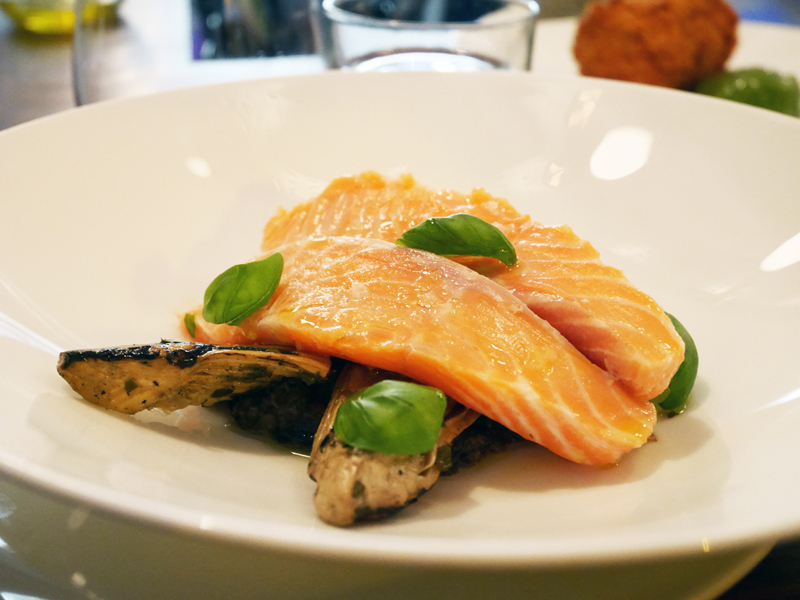 Delicate and lightly poached sea trout was given an edge with a punchy truffled mushroom pesto and artichokes that always benefit from that delicious char from the grill. 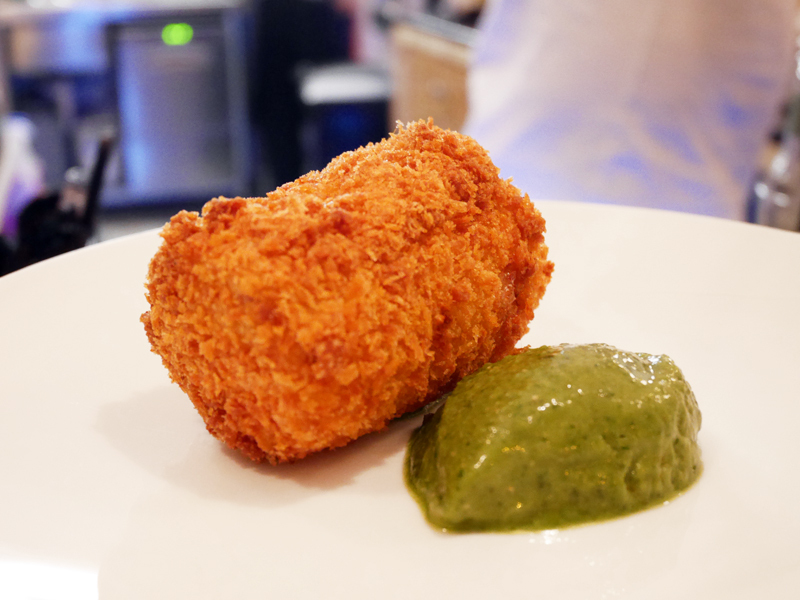 Becoming a bit of a signature dish is their crochette, beautifully crisp and filled with plenty of succulent rabbit. Served with a seasonal vibrant wild garlic pesto to lift the earthiness of the meat. I rarely order pasta out but had to see what it would be like. 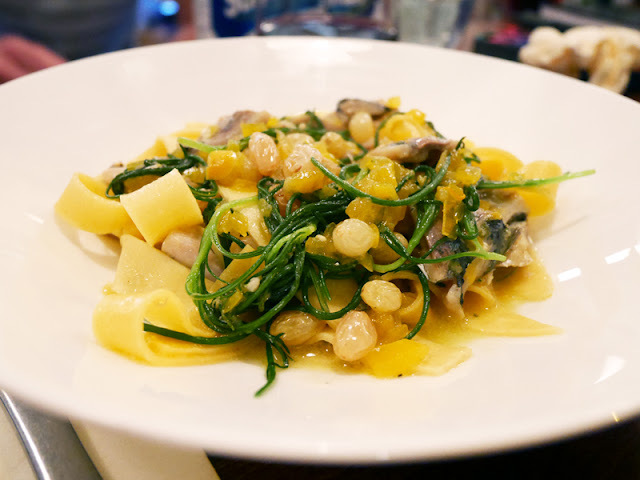 Very tempted by the Sussex veal ragu with one of my favourite pasta shapes, fazzoletti (meaning hankerchiefs - delicate, thin little sheets) we instead chose the tagliatelle with a typical Sicilian sauce of sardines, saffron and pickled sultanas garnished with some lovely monks beard. I can imagine this not to be to everyone's taste, but these flavours are so typical of that region, you could close your eyes and pretend you were on holiday. I love this about Italian food, the flavours transport you across the country. There is absolutely no way you'd find a dish like this in central Italy, nor gnudi in the north or canederli in the south. So diverse and always something new to discover, I used to think my family were bonkers driving four hours to the coast for lunch as it was not the done thing to eat fish in our mountainous village or to head over to the other side of the hills for a particular chocolate biscuit in a particular month as that's when they were best. God love them for it because. That's. How. Important. Food. Really. Is. 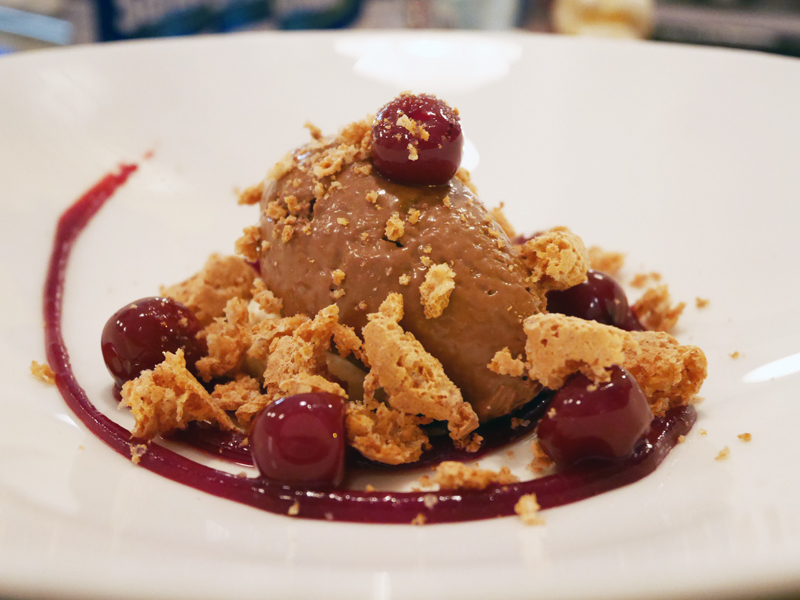 Anyway, back to the job in hand, we finished with affogato and a lovely little chocolate cremoso, heavier than a mousse yet silky and indulgent, topped with morello cherries and an amaretto biscuit crumble. Perfect with a glass of vin santo or marsala I imagine. They may be still fresh off the boat in restaurant form but with awards winging their way already, Cin Cin is certainly up there with the better restaurants in the city already. Head chef Jamie Halsall is classically French trained which brings a lightness of touch and elegance to the dishes. Service is friendly and intimate. Founder David Toscano is still very much in house and showing how much he deserved to win the "Best Welcome" award at the Brighton Best Restaurant Awards earlier this year. 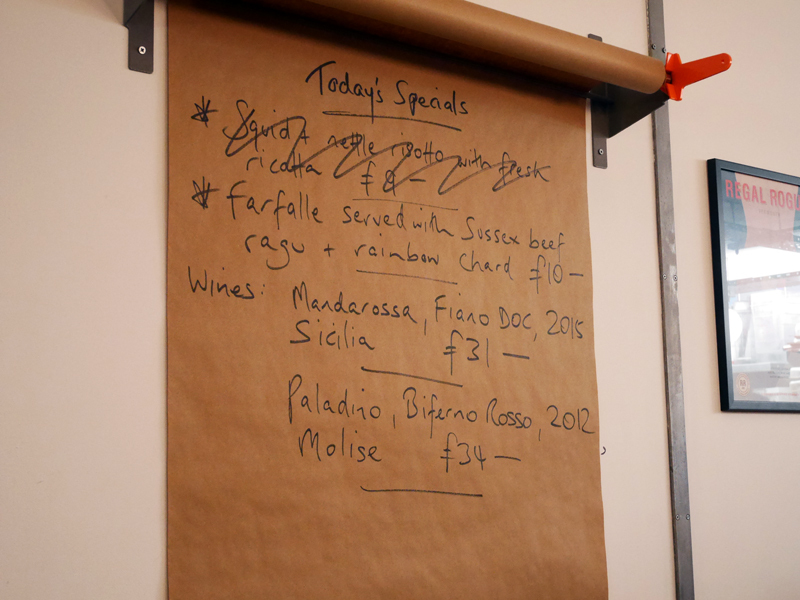 Also worth looking up is their Ten Pound Tuesday - a beautiful plate of authentic, homemade pasta and glass of wine or a beer for less money than ten chicken wings from Nandos. Exactly. *You want proper pizza in Brighton? Fatto a Mano, Franco Manca and Nuposto are your friends.